Seventh-day Adventist world leaders called for the training of a younger generation of leaders to complete the church’s mission of spreading the gospel. About 40 church leaders, including division presidents, university presidents, and senior General Conference officers, spoke about the role of young people at the 10th Global Leadership Summit in Ukraine’s capital, Kiev. The annual event encourages world divisions to provide their members with regular leadership training opportunities. Several delegates cautioned during a round-table discussion on Tuesday, the opening day of the three-day summit, that the church could not hope to maintain its identity and fulfill its mission without taking better steps to train young leaders. Guillermo Biaggi, chair of the summit and a general vice president of the world church, said the parts of the world where young people witness actively tend to have greater membership growth, while the church is “aging” in the places that face challenges with secularism and materialism. Juan Prestol-Puesán, treasurer of the world church, emphasized the importance of harnessing young people’s energy, noting that flying halfway across the world takes a much heavier toll on him physically these days than when he was younger. “I’ll be honest with you, I take one flight over here and it knocks me out,” Prestol-Puesán told the summit as delegates nodded in agreement. Representatives from various world divisions shared their local training initiatives. In 2016, the East-Central Africa Division organized its first division-wide leadership summit and plans to hold it every two years, said Philip Baptiste, special assistant to the division’s president. Smaller leadership conferences are planned at the union level on the other years. Inter-European Division president Mario Brito passed around a list of 51 leadership training and development meetings that his division has prepared for 2017. The North American Division, represented at the Kiev summit by executive secretary G. Alexander Bryant and treasurer Tom Evans, earlier highlighted its eagerness to engage young leaders at its year-end meeting last November. 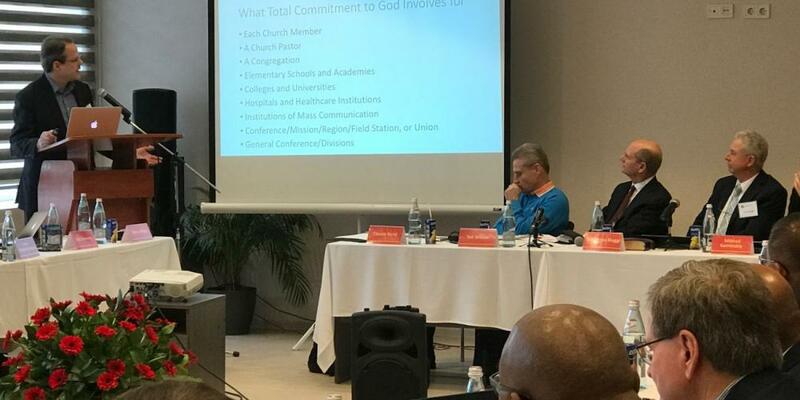 Thirteen people under the age of 30 were among the 341 delegates with full voice and vote at that meeting, and their number will increase after the division voted to invite 10 Adventist students from public universities to join its Executive Committee, its top leadership body. Wilson said Tuesday that church leaders should be intentional in training young people to lead. “Intentional focus by current leaders is necessary in order to invite younger leaders to participate in not only accepting the broad mission Christ’s has entrusted to us but also to develop the practical methods to accomplish this mission with complete reliance on the power of the Holy Spirit,” he said. When a GYC Volunteer Came to My House Little did I know that I would become a GYC volunteer a year later.